Authorities investigated the scene at 77 Lenox St. where Boston Police said officers shot and killed a man as they tried to arrest him. A Boston police officer fatally shot a man who allegedly charged at him and other officers with knives Saturday afternoon as they responded to a domestic violence call in the South End, police said. Police arrived at a home on Lenox Street after a woman called for help just after 3 p.m., saying her boyfriend had assaulted her. The man then turned on police with the knives, and he was shot, said Boston police Superintendent-in-Chief William G. Gross. The extent of the woman’s injuries was not immediately known, but officers at the scene said she had facial injuries, according to Officer Rachel McGuire, a spokeswoman for the Boston police. It was the city’s first police shooting of the year, police said. Last year, officers in Boston killed three of six people they shot. The man, whom police did not identify, was taken to Boston Medical Center, where he was pronounced dead, Gross said at the scene of 77 Lenox St.
“The officers attempted to place the suspect under arrest, at which time the suspect armed himself with multiple knives and lunged at the officers,” Gross said. The incident is being investigated by Suffolk District Attorney Daniel F. Conley’s office and the Boston Police Firearm Discharge Investigation Team. Officials from the district attorney’s office were at the scene and began an independent investigation, Suffolk district attorney spokesman Jake Wark said in a statement. Police officers combed the area Saturday afternoon while neighbors poked their heads out windows and doors to try and see what was happening. Lenox Street was cut off by police vehicles at Shawmut Avenue and numerous layers of police tape blocked the area around the site of the shooting. Police stood outside the open door of 77 Lenox St., a white three-decker connected to other apartment buildings that line the street. Sugey Hermasme, 32, had walked over from her home on Shawmut Avenue to see what had happened. Hermasme said she had lived in the area since 2004. On her way to her Lenox Street apartment, Shakyla Jones, 21, said she was shocked when she heard what happened. But she said it wasn’t the first time violence occurred there and that there are troubling incidents, particularly in the summer. Neighbors came and went, peering over the yellow tape and police vehicles. Last year, at least 23 people were shot by police across the state — 11 of them fatally, according to State Police and Boston police. Since 2008, the total number of people shot by officers and troopers has grown every year, peaking in 2013. In that time, there were 86 shootings, 67 of them justified, police said. In 2012, there was just one officer-involved shooting in Boston. 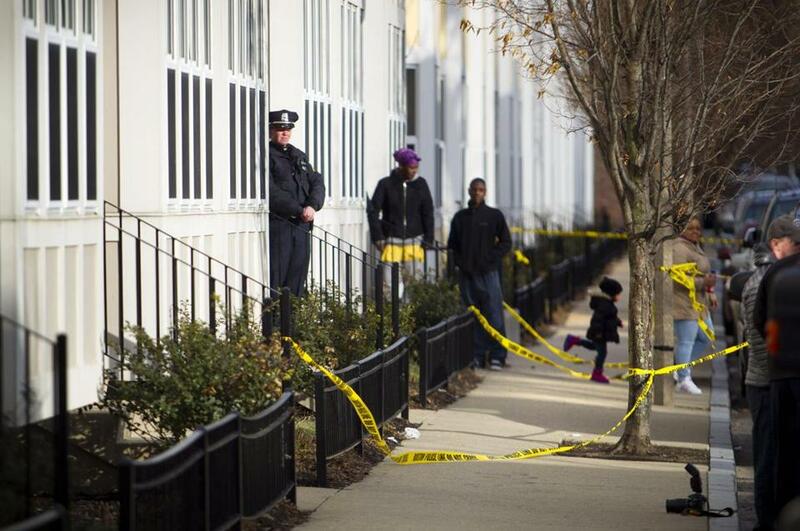 State Police last year investigated 17 shootings by police, compared with 14 in 2012. Globe Correspondent Gal Tziperman Lotan contributed to this report. Derek J. Anderson can be reached at derek.anderson@globe.com. David Abel can be reached at dabel@globe.com. Follow him on Twitter @davabel.